PUNE: According to IMD, the intensity of rainfall is likely to reduce between August 30 and September 1, with one or two spells of rains expected during the period. On Monday till 8.30 am, 22.6 mm rainfall was recorded in Pune while from 8.30 am to 5.30 pm, the rainfall recorded in the city was 3.8 mm. Heavy rains are expected in the city in the next 24 hours, said the Indian Meteorological Department (IMD) in a statement on Monday. IMD has also predicted heavy rainfall in central Maharashtra, including Pune and parts of Marathwada and Vidarbha in the next 24 hours. On Monday till 8.30 am, 22.6 mm rainfall was recorded in Pune while from 8.30 am to 5.30 pm, the rainfall recorded in the city was 3.8 mm. 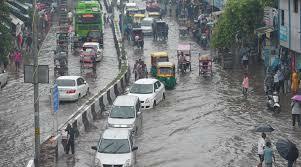 The highest rainfall recorded in the state on Monday was at Colaba in Mumbai at 12 cm. According to IMD, the intensity of rainfall is likely to reduce between August 30 and September 1, with one or two spells of rains expected during the period. Officials informed that after September 1, the rain intensity is likely to increase again. AK Srivastava, head of the climate monitoring and analysis group of IMD, said that heavy to very heavy rainfall is expected in the upcoming week in Konkan and Goa and that the regions may receive excess rainfall between August 29 and September 1. IMD officials also noted that the south-west monsoon has been vigorous over central Maharashtra and coastal Andhra Pradesh and active over Nagaland, Manipur, Mizoram, Tripura, West Bengal, Odisha, east Uttar Pradesh, Uttarakhand, west Madhya Pradesh, Gujarat Region, Konkan and Goa, Marathwada, Chhattisgarh, coastal and north interior Karnataka and Kerala. However, it has subdued over Arunachal Pradesh, Haryana, Punjab, Himachal Pradesh and Jammu and Kashmir. According to the information available with the IMD, from June 1, the total rainfall received in Pune was recorded at 537.7 mm, which is more than the average expected rainfall by 107.1 mm. With heavy rainfall in the catchment areas of the dams in Pune, Khadakwasla, Pawana and Panshet dams are already at their maximum capacity. Water levels at Temghar, on Monday, had reached 44.13 % of its capacity.